So, it was early November, I was in Natchez, Mississippi, and it was time to start thinking about how I was getting home. Flying was not an option. I had made that promise to myself before I left, and I was standing by it. At this point, the thought of riding all the way back home to California seemed not too crazy. Clearly, I would want to stay south, given that we were rapidly marching our way to winter, but that would also mean that Texas stood in my way. 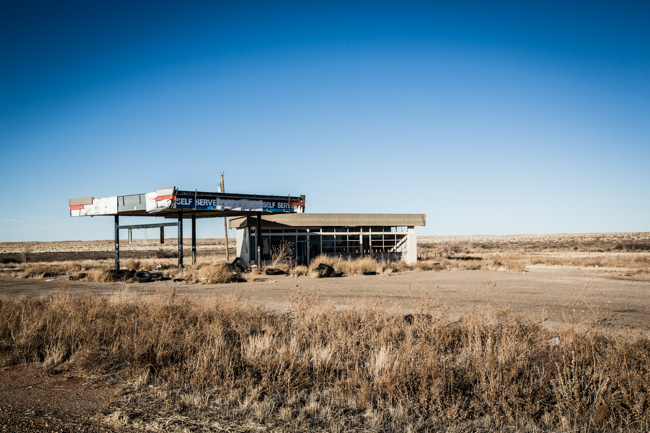 A forgotten desert gas station like this haunted my imagination. From Atlanta to Natchez, aka Now what? Now what? It’s a question that keeps coming up. The transcontinental bike ride has been completed for a while. It seems a little wrong to keep up a blog that was designed for one purpose that has now been realized, but it also seems really sad to just let it die. Besides, who knows, maybe it can still play a role in recruiting bone marrow donors. Let’s see what happens. Sometimes I get the urge to draw something. My niece sparks that in me. Lots and lots and lots of thank you cards. Potstickers! Someone in this family should know how to make potstickers from scratch. Yay pie! Pie for days! So there I was, sitting in Atlanta. I had a few things I wanted to get done. First of all, relax and spend time with my sister Cindy and her family. Goof around with the niece and nephew. Enjoy not being in the rain. Take advantage of having a kitchen and easy access to fresh fruits and vegetables and running water. Write a whole lot of thank you notes. Snuggle with the cat. Eat pie. But one can only sit around enjoying the easy life for so long. Though I did find some fun YouTube channels. What’s next? Get a job? Like, a real job? I was hoping for an epiphany while being on the road. I'm an instructor at a Coding Bootcamp, but I made this website before I knew how to build my own from scratch and was instead riding my bicycle all day every day across the country looking for bone marrow donors. Maybe someday I'll rebuild it, but that would be a lot of work. Bicycle travel. Motorcycle travel. Life. Travel, environment, philosophy. Other stuff too.